This Playbook identifies 40+ low-cost tips, activities and actions that small business can take right now (some in only 10 minutes a day) to attract, engage and retain staff. Written in an innovative “travel guide” format, author Lisa Taylor includes special sections on new graduates, the aging workforce and family enterprises, and provides planning templates and links to unique resources. The Playbook also features research, facts and statistics that shed new light on Canada’s small business economy and workforce. Career management – even for the smallest of small- and medium-sized enterprises (SMEs) – offers a strategic lever for stronger company performance. Indeed, career management affects more than just employee satisfaction and loyalty. It drives better customer service, faster identification of ways to improve business operations and increased opportunity for growth – for staff as well as for your business. Publishing of the Playbook was made possible in part by the generous contributions of Knowledge Champions. Canada’s business profile is overwhelmingly positioned in the small and medium-sized business space; these businesses are the backbone of the communities we call home. Often, within their daily operations, there is not time for business owners and managers to accomplish all that is necessary for success – including the time to think about critical human resource planning. That is why we are so pleased to be part of the Career Management for Small Business Playbook; this resource provides realistic tools to assist small- and medium-sized businesses in attracting and retaining employees who will become an important part of their future success strategy. The most important part of any business is, at the end of the day, its people. Investing in employees’ career development is key to promoting an innovative and productive workplace culture – successful companies cultivate a workforce comprised of people who feel fulfilled, valued and nurtured in their jobs. Some businesses recognize this but lack either the resources or a full understanding of how to effectively provide this, and that’s why this type of support provided by CERIC is so essential. 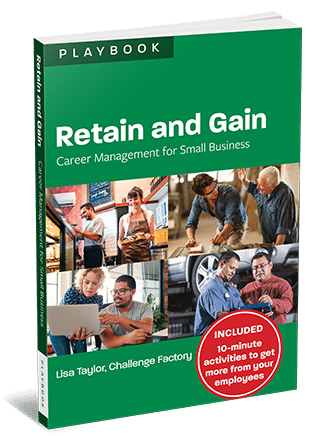 The Retain and Gain Playbook is a foundational guide for every entrepreneur and small business owner to attract and retain a successful team through focusing on employee career development and smart planning. Providing options and examples underpinned by data, the Playbook is perfect for the busy business owner who needs to support and scale high-performance teams. This is a smart, accessible, action-focused resource for small business owners and managers who understand that helping employees grow and develop is essential to the success of any organization big or small. In this book, Lisa shares her expertise and passion in career management and makes the learning fun! Retain and Gain: Career Management for Small Business is a great resource for Canada’s nonprofit and charitable sector as well – most of whom are small- and medium-sized employers with many of the same issues retaining staff as our small business counterparts. The practical tips and strategies in this guide are worth exploring! The small business community needs practical, actionable tools that make a real difference with their employees. I found this Playbook refreshing and it has led me take new action with my own staff at TD Bank. A must-have resource for managers of teams large and small in any business. An innovative and important resource for small business owners looking to scale up. Our consultations with young entrepreneurs and supporters across the country have shown that acquiring and retaining talent is critical to facilitating business growth – and this Playbook provides much-needed tools to achieve that. Management is about getting the right things done and your and your employees’ careers top that list. This ‘travel guide’ helps for sure. Try it.